Product prices and availability are accurate as of 2019-04-16 16:05:22 EDT and are subject to change. Any price and availability information displayed on http://www.amazon.com/ at the time of purchase will apply to the purchase of this product. WIDESETA This totally unique marker design lays down a swash of color; not achieve able with any other marker. It offers the smoothest most consistent coverage over large areas and is ideal for architectural drawings backgrounds calligraphy sign making and general art use. Features: -Set includes the following colors: Amethyst V17, Flesh R02, Lipstick Red R29, Chrome Orange YR04, Acid Yellow Y08, Yellow Green YG03, Nile Green G07, Sky B24, Ultramarine B29, Prussian Blue B39, Burnt Umber E29, Black 100. -Wide collection. -12 Various inks to match. -Tip of the nib offers a fine point for detail work. -Markers are refillable and have two replaceable nib options - broad and calligraphy. 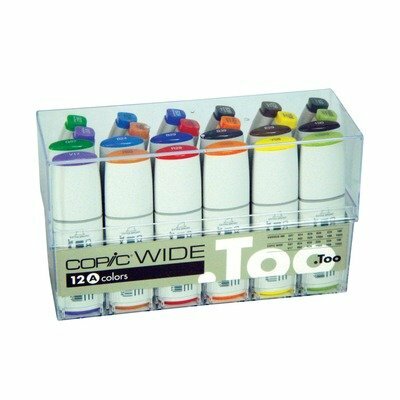 -Color choice is expandable to include the entire selection by purchasing various ink refills and empty markers. -All wide sets include matching refill inks.